In response to an open letter sent to University President Ron Liebowitz two weeks ago, Brandeis will hold an open forum to discuss accessibility on campus. 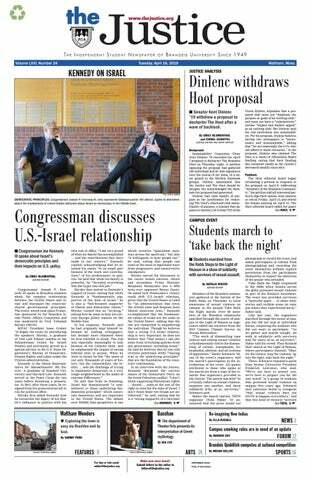 The announcement, made by Liebowitz at Sunday’s Union Senate meeting, marks a success for the group that wrote the letter, Addressing Accessibility at Brandeis. Jack Rubinstein ’20, representing AAB, sent the open letter to Liebowitz in a Nov. 8 email, along with a document of personal accounts from Brandeis students with disabilities sharing their experiences on campus. Liebowitz also expressed his desire to make campus more accessible, noting that he personally intervened during the planning of Skyline Residence Hall to make it more accessible to students with mobility disabilities. “Though the plans [for Skyline] met all [Americans with Disabilities Act] requirements, … it would have been impossible for students who couldn’t navigate stairs to go to the upper floors of the building. … I requested that we change our plans [to make Skyline wheelchair accessible], even if it meant… additional costs,” he explained. Having some students be unable to visit their friends on upper floors would not have aligned "with our philosophy and values,” he said. There is little question that parts of the Brandeis campus are inaccessible to many students with mobility impairments: For example, none of the buildings in East Quad, Massell Quad, Rosenthal Quad or North Quad contain elevators. The attached five-page document, titled “Personal Accounts,” contained a number of anecdotes from students who wrote about difficulties they encountered with transportation across campus, learning disabilities, academic accommodations and housing. In the same account, the student accused the Golding Health Center of lacking transparency. “I requested a wheelchair when I hurt my ankle but was denied for an unknown reason by the Health Center,” the student wrote. Rodgers-Kay explained that the University provides crutches, not wheelchairs, to students with relatively short-term mobility impairments, such as ankle injuries. Another student’s account expressed frustration that there is no list of classes that students with learning disabilities can choose from to fulfill the University’s language requirement. Rodgers-Kay explained that this list has not been created because the number of classes that can count toward the language requirement is huge and the classes that can count may change depending on what a student chooses to focus on. For example, she said, a student might choose to take three classes in Asian culture if they’re having difficulties in a language class. If the student has already taken two of the classes in that cluster, a class about French history would not fulfill the requirement, since the three classes need a common cultural focus. But if that student were taking three classes about French culture for the language requirement, that class would fulfill the requirement. Another student wrote that the Department of Community Living didn’t take students’ requests for housing accommodation seriously, asserting that “Skyline has available, empty singles on floors with single-use bathrooms.” In an email to the Justice, Assistant Dean of Student Affairs Tim Touchette, who works for DCL, said in an email to the Justice that the student’s assertion about Skyline housing was simply false. “Although rooms are held for medical reasons all over campus, there are no empty singles, or any other vacant rooms, specifically in Skyline. Availability on campus is constantly changing, and we always keep a small number of rooms open for emergencies, temporary accommodation, and other reasons,” Touchette explained. — Editor’s note: Justice editors Morgan Mayback, Maya Zanger-Nadis and Lily Swartz signed the open letter. Sam Stockbridge is a DCL employee.